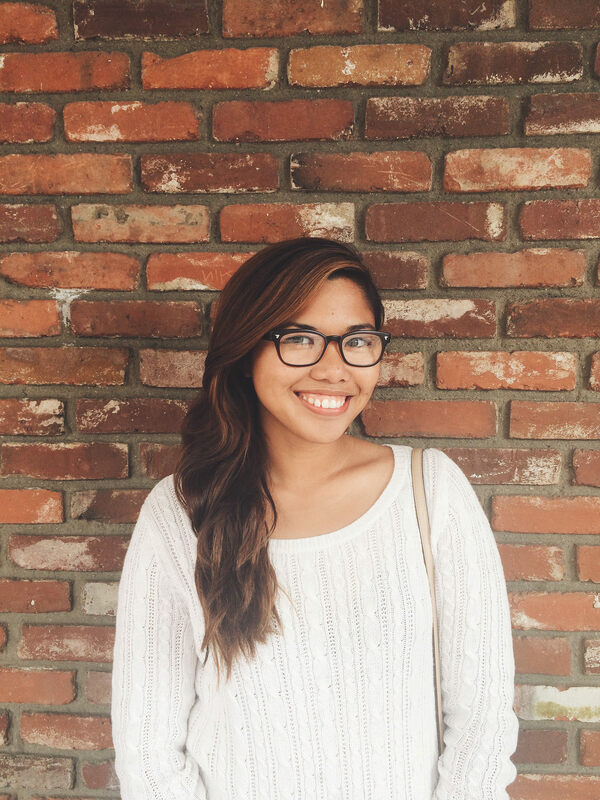 For Favreau, story is king. 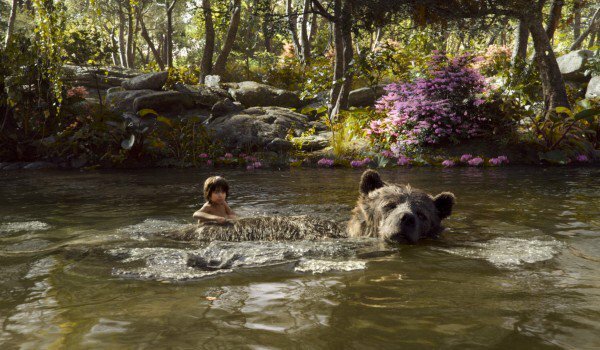 Director Jon Favreau’s The Jungle Book couples the latest in technology with sophisticated storytelling as it tackles mature themes found in Rupyard Kipling’s original tale. With the latest in CGI technology, Mowgli’s journey to find his place in the jungle is captivatingly rendered on the screen. While exploring some of the deeper themes in Kipling’s original short stories, the film still retains the heart and charm of the ‘67 animated version. Many strange tales are told of this Jungle. 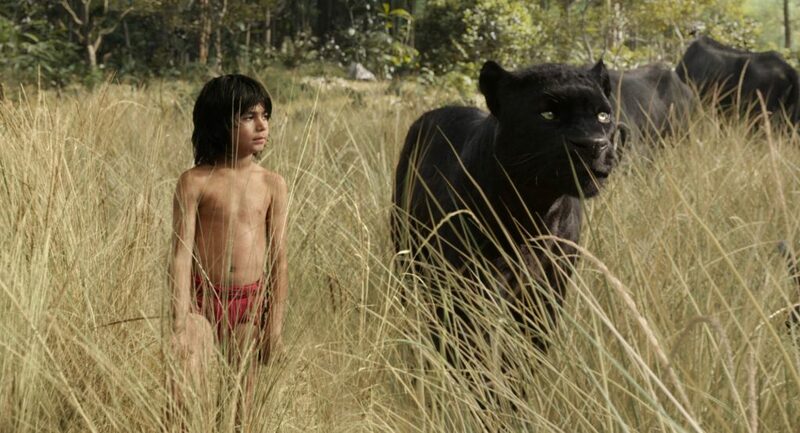 But none so strange as the tale of the cub we called Mowgli,” narrates Bagheera (Ben Kingsley), the black panther that rescues Mowgli and finds him a home in the jungle. We meet Mowgli, played by newcomer Neel Seethi, living amongst a pack of wolves and is treated like one of their own. He has a little brother named Gray, wolf parents, and lives peacefully among all the jungle animals. There is even a “water truce” set in place so that all animals, predator and prey alike, can drink from the same watering hole unobstructedly. However, a terrorizing tiger named Shere Khan (Idris Elba), disrupts the peace spreading fear that Mowgli, a man-cub soon to be man, is a danger to their society. “Man is forbidden!” Shere Khan says. He threatens the wolf pack that if Mowgli is not expelled to civilization willingly, he will make sure of it himself. Fearing Mowgli’s safety, his adoptive parents, Akara and Akela (Lupita Nyong’o and Giancarlo Esposito), allow him to leave the pack and return to his kind while promising to visit periodically. 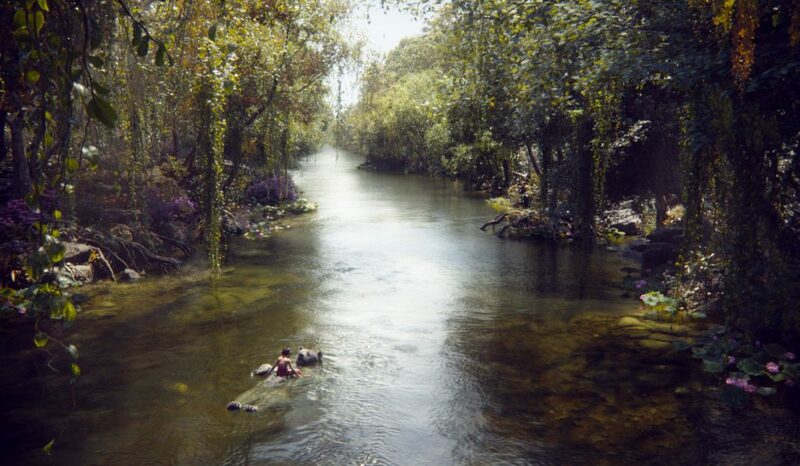 THE JUNGLE BOOK – (L-R) MOWGLI and RAKSHA. ©2016 Disney Enterprises, Inc. All Rights Reserved. 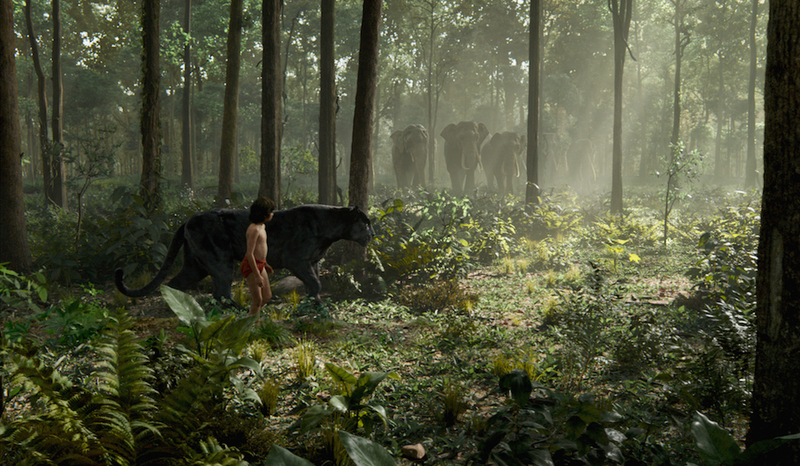 As Mowgli goes deep into the far reaches of the lush Indian jungle, he encounters many creatures. From majestic elephants to a hypnotizing anaconda and from a free-spirited bear to megalomaniac giant orangutans, the film shows all aspects of the jungle including the scary, uncharted, and dangerous. The film doesn’t hesitate to emphasize and play on the imminent dangers found in the jungle. While the film is packed with adventure, it is even-paced. The film began with classic storybook nation by Bagheera and this narration helps ground the film. This film is an example of economic storytelling and using flashback to develop the characters. There are fast-paced scenes where the characters are sprinting and hurtling through the jungle’s intricate web of branches and vines. 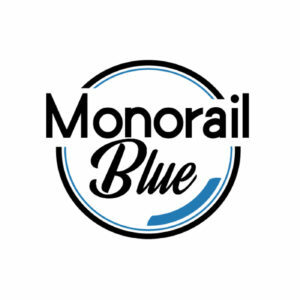 There are slow-paced, truly magical scenes such as Mowgli riding on Baloo’s (Bill Murray) belly down the river while singing “Bare Necessities” on a lazy afternoon and Bagheera and Mowgli kneeling in front of elephants as a sign of respect. Not to mention moments of comedic brilliance by Bill Murray as Baloo. Each scene lends to the story and has weight. The movie still contains the two musical numbers, “Bare Necessities” and “I Wanna Be Like you” and a nod to “Trust in Me” in the end credits. 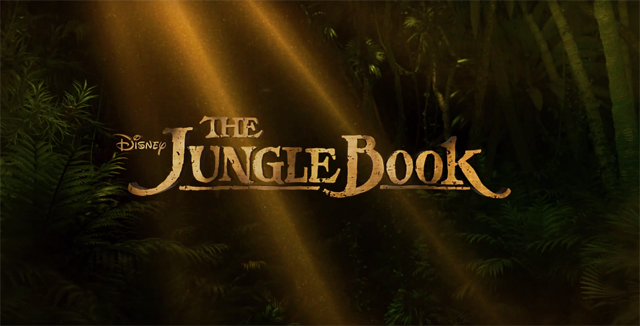 Perhaps the most moving aspect of the film’s soundtrack is the slowed-down, orchestrated version of “Bare Necessities,” coupled with extraordinary scenes of the jungle and all its beauty. As the ‘67 version was the last film personally overseen by Walt Disney, Favreau wanted to pay tribute to Walt’s legacy as an innovator who always pushed the envelope in terms of technology. The production team for this version wanted audiences to see a real world, one that they can easily immerse themselves in. All environments in the film are digitally built with minimal live-action sets. The animation team used footage of animals in the wild as reference to create photo-realistic animals. These animals look as if they’ve been plucked from the Discovery Channel. Coupled with performances by a star-studded cast, the result is fantastic. While the team did take liberties on visuals aspects such as scale, everything was rooted in reality. We take the best 12 of the photo-real animation process, the best motion-capture techniques and the best of live-action shooting and combine these three things in a way that nobody’s done before. 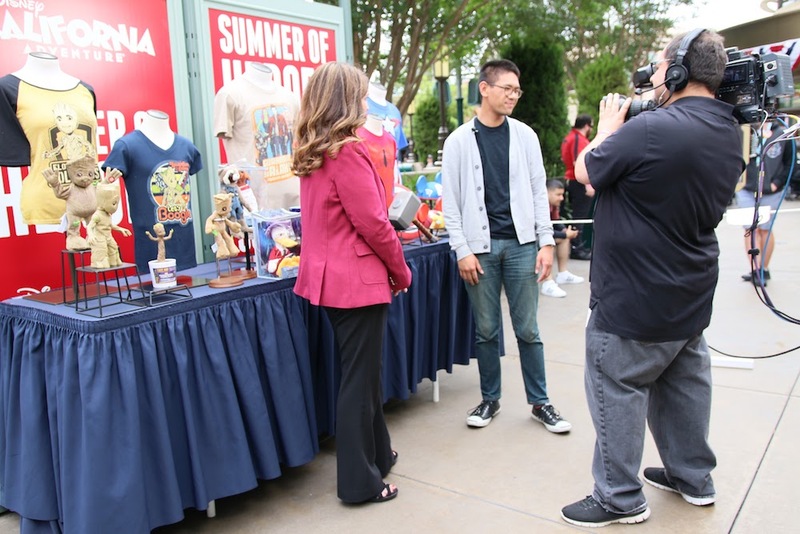 We discovered that we could use cutting-edge technology to create something that appears completely realistic and organic to the audience,” says Favreau. 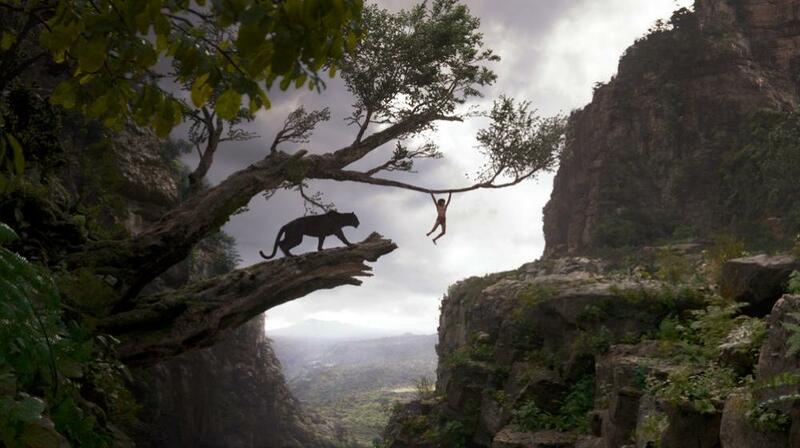 THE JUNGLE BOOK – (L-R) MOWGLI and BAGHEERA. ©2016 Disney Enterprises, Inc. All Rights Reserved. Favreau explores the theme of “humanity versus nature” by playing upon the symbol of mankind’s power—the red flower. Shere Khan, who was scarred by man’s red flower, seeks revenge on mankind through Mowgli. Whereas, King Louie (Christopher Walken) seeks to wield mankind’s power and assumes that Mowgli can produce the red flower for him. As he sings “I Wanna Be Like You,” the usually light-hearted song has a darker tone to it. All the while, this red flower has such a destructive capability on nature. Mowgli is torn between his identity as a man, his innate ingenuity to create “tricks” and inventions to survive, and being raised by animals and their ways of existing. Through this journey, he learns much about himself and develops a deep respect for the jungle, his home. Overall, Favreau doesn’t shy away from building upon these complex themes and power dynamics. In short, audiences will appreciate Favreau’s desire to create the world which Walt would’ve created if the technology was available. His attention to the story itself and building the characters will win the affections of those who fell in love with the story of a little man-cub named Mowgli all those years ago. And, definitely stay for the credits for a musical treat.